Joe Frazier gave his most prized-posession to Nelson Mandela!! 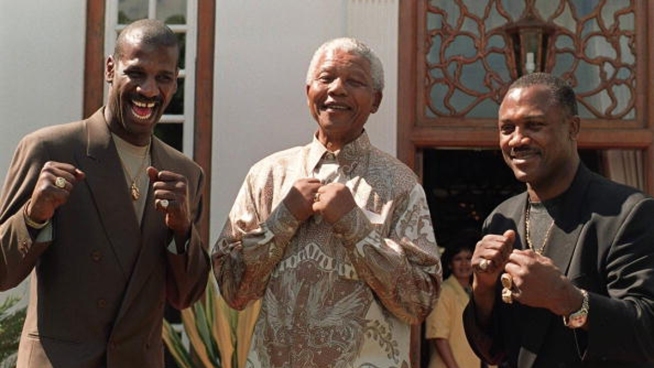 PRETORIA, SOUTH AFRICA: South African President Nelson Mandela (C) poses with former heavyweight boxing champions Michael Spinks (L) and Joe Frazier (R) at his official residence in Pretoria 06 December 1997. The boxers are visiting South Africa at the President's invitation. Nelson Mandela passed away 5 days ago on Dec 5, 2013 at the age of 95. Joe Frazier left us 2 years ago on Nov. 7, 2011 at the age of 67. Once upon a time, back in 1990, after 27 years of imprisonment, Mandela was freed and during a tour of the USA, he wanted to meet Joe Frazier and Muhammad Ali. Frazier wanted to give Mandela the best gift that he could think of. Can you guess which of Smokin' Joe's posessions he gave to Nelson Mandela? Read on! Philadelphia (AP) -- Joe Frazier was humbled, and had to find the right symbolic gift to present to Nelson Mandela. Smokin' Joe wanted Mandela to know he was a true champion. No autographed picture, no robe, no gloves. Those wouldn't be good enough for this. Frazier, instead, picked the World Boxing Council heavyweight championship belt he was awarded after defeating Muhammad Ali in 1971. Mandela died Thursday at the age of 95. "I said, 'Are you talking about THAT belt,'" Frazier's former manager, Burt Watson, said. "He wouldn't let anyone touch that belt. It was his pride and joy." When Mandela emerged from 27 years in prison, he wanted to meet Frazier and Ali during a tour of the United States. Mandela's representative reached out to Watson about Frazier coming to New York for a meeting before the South African leader's speech at the United Nations building. "When I mentioned to Joe that they wanted him and Nelson Mandela personally requested to meet him, he was in awe," Watson said. "Joe wasn't in awe of a lot of things, but he was of that. He said he wouldn't miss it. He was honored. He knew of Mandela, knew of the struggles, knew what was going on." Frazier, who died in 2011 after a brief battle with liver cancer at the age of 67, was "awe-struck" by Mandela. Frazier and Watson were ushered into a room to convene with Mandela. The only other people there was a Mandela associate and two members of the NYPD. "Joe Frazier's face lit up," the 65-year-old Watson said. "They hugged and spoke to each other. He told Joe how much he respected him, how much he appreciated what he did to the world. Joe presented him with the belt and said, 'I want you to have this.'" For his little slice of history, Watson took the belt and snapped it around Mandela's waist. "It was a little awkward, because I didn't know to put it on him so it would stay," Watson said, laughing. "It was heavy." Mandela and Frazier posed for a picture, then it was time for the speech. Frazier left after Mandela's talk and the two never met again. Watson, a Philadelphia native, managed the former champ from the early 1980s until the late 1990s. He is the Ultimate Fighting Championship's site coordinator, and has worked for the mixed martial arts company since 2001. Watson saw Mandela again about 10 years after their 1990 meeting and mentioned he was there with Frazier at the United Nations. "When I mentioned the belt, he lit up like a Christmas tree," Watson said by phone from the UFC's weekend show in Brisbane, Australia. Watson said it was no surprise that Frazier was at ease around Mandela. "Joe was a person of the people," he said. "He was so comfortable being around people." This story flashed across my Bloomberg news. UFC Tonight's "Top 50 Moments of 2012"
Happy 87th Birthday Robert Smith!! Happy 35th Birthday Manny "Pacman" Pacquiao!! Happy 44th Birthday Chuck Liddell!! Happy 35th Birthday B.J. Penn!! Happy 47th Birthday Royce Gracie!! James W. DeMile - Why Train Chi Sao? Happy 45th Birthday Lucy Liu! !